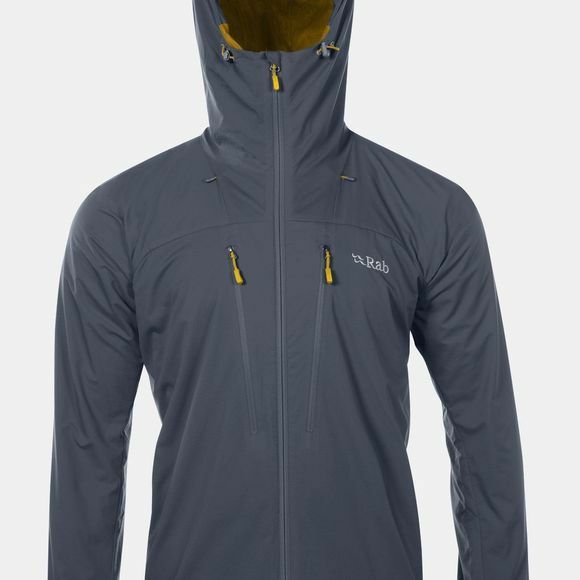 Streamlined and slim fitting, the amazingly comfortable Men's Vapour-rise Alpine Jacket from Rab is highly breathable but also offers excellent protection from the elements: exactly what you need in an alpine-ready softshell. Lightweight Pertex Equilibrium fabric is not only wind and water-resistant, but also allows moisture to move away from the skin to keep you dry inside when you are working hard. Features include a two-way zip with internal storm flap as well as an adjustable hem drawcord and hook and loop cuffs for a closer fit. Two zipped chest pockets and an internal pocket mean you can keep your essentials close to your body. Whether you are lead climbing high above the Chamonix Valley or backpacking in the Pyrenees, the Vapour-rise Alpine Jacket lets you travel fast and light, in comfort.